Good news for the Bharatiya Janata Party (BJP) in Gujarat has often come from its opponents — and this time, it's not only the Congress but also its splinters and alliance partners who are giving the BJP reason for cheer. Shankersinh Vaghela, who quit the Congress earlier this year, has now announced his support for Jan Vikalp, a public forum created by his supporters. It's clearly a do-or-die tactic by a wounded soldier, his idea of revenge, to hit back at the Congress for the party's decision of not handing him the baton ahead of an Assembly election that promises a possible victory. He minced no words at his press conference on Tuesday. "I told the Congress party that I could win at least 90 seats (out of 182), and to give me a free hand. But they did not," he said. Vaghela, who has been Leader of Opposition in the Assembly, had never made such a demand in earlier elections. He claimed that his new front will not be a political party, but rather an "alternative force" to garner public anger against the ruling BJP and the ineffective Congress. However, speaking to Firstpost, Vaghela conceded that it may already be advantage BJP. "The Congress had an opportunity for the first time in 25 years to defeat the BJP. That's why I wanted them to agree to me," he said. The maverick leader wanted to be declared the party's chief ministerial candidate, to have the final say in matters regarding candidate selection, and to have state Congress president Bharatsinh Solanki removed. The party leadership was unwilling to accede to these demands, being of the opinion that except winning his own seat, Vaghela hadn't demonstrated his abilities in being able to clinch the state on his own. And although he did appear to be the best candidate among the available lot, his track record didn't inspire much confidence in the party leadership. 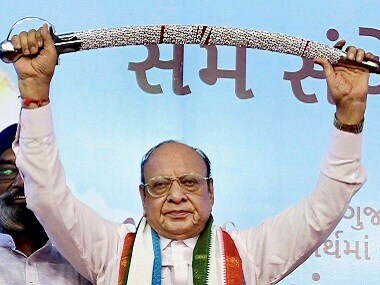 Vaghela's Rashtriya Janata Party, which he formed after his 1995 revolt with the BJP, could fetch only an apologetic four seats despite all his state-wide stature. The party was of the view that Bapu, as he is known to his supporters, wanted to have his cake and eat it too, especially once a possible victory began appearing on the horizon. The BJP has realised that it has an uphill task this time, not only because of the absence of Narendra Modi as its chief ministerial candidate, but also because of a host of issues staring in its face. The key among them is the agitation by the Patels or the Patidars. The Patels, who have always been the state's political and economic backbone, have turned against the BJP. The ruling party first sensed revolt due to the Patidar agitation in December 2015 when, following Hardik Patel's stir, the BJP suffered shocking reverses in elections to district, taluka and nagar panchayats. From 30 out of 31 district panchayats in its kitty in 2010, the BJP was reduced to just six while the rest went to the Congress in December 2015. Similarly, the party was reduced to 67 seats from 150 taluka panchayats and the Congress rose from 26 to 134. This is a reflection of a major dent in the ruling party's votebase in rural and semi-urban areas, and the disenchantment of the Patidars is a major reason for this. 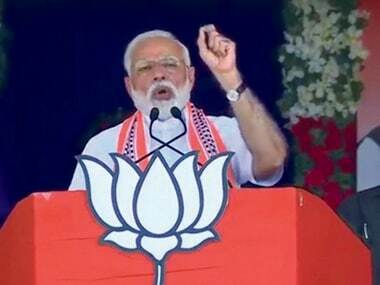 That there is a Patidar groundswell against the BJP was visible yet again during a three-day Ahmedabad-to-Somnath yatra led by Hardik Patel, which concluded just 24 hours ahead of Prime Minister Narendra Modi's birthday on 17 September, an occasion when BJP celebrated 'Narmada Mahotsav' with great fanfare. Incidentally, Hardik Patel's yatra received a more vociferous support than the 85 Narmada chariots taken out by the BJP government which met with public protests as well at several places en route. 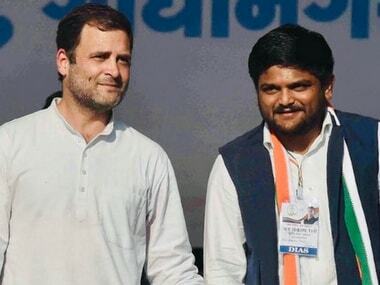 And to make matters worse, the 24-year-old has already declared his Patidar Anamat Andolan Samiti's (PAAS) support to the Congress. Apart from this, the Congress is also trying to make the most out of farmer distress in the state. Congress vice-president Rahul Gandhi, in a well-attended townhall meeting with party workers in Ahmedabad recently, referred to the Rs 36,000 crore farm debt in Gujarat. And the party backed it with a promise to waive off loans if elected to power. Incidentally, even the Bharatiya Kisan Sangh, an affiliate of the RSS, has been demanding a loan waiver, citing losses to farmers because of rising costs of production and falling incomes. Driven to the wall and realising that its much-publicised target of winning 150 seats is looking dim, the BJP has little option but to drive a wedge in the Opposition. Congress has traditionally won 50-60 seats in Assembly elections in Gujarat, even at the height of the saffron wave in 2002. And the situation is decidedly worse for the BJP today than it was 15 years ago. Given this, the Congress only needs 30-40 seats more than it won last time, to cross the simple majority mark of 91. The BJP machinery is already at work. Resignations of six Congress MLAs ahead of Rajya Sabha polls in August, and of eight others, including Shankersinh Vaghela, after cross-voting for the BJP, was just the beginning. Simultaneously, two Nationalist Congress Party (NCP) MLAs in the state also voted for the BJP, going back on the party's promise to Congress president Sonia Gandhi's political secretary Ahmed Patel. At a time when the NCP is inching towards the BJP, even in its home state Maharashtra, this reshaping of political alliances could hurt the Congress. The bonhomie between Vaghela and NCP's top leadership, including Sharad Pawar and Praful Patel, is common knowledge. The NCP has already announced its plans of contesting 60-70 seats in Gujarat, while Congress has also made it clear that it intends to have no alliance with Pawar. In 2012, NCP contested nine seats and won two in Gujarat; in 2007, it contested 10 and won three. In its home state Mahrashtra, it came a poor fourth place, winning just 41 seats in a 288-member House. 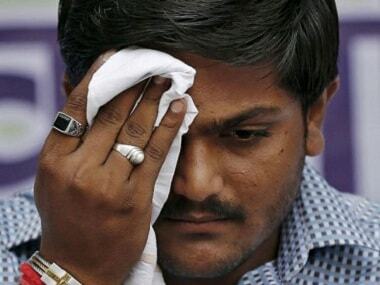 In effect, Vaghela's Jan Vikalp and NCP could dent Congress more than they hurt BJP. Vaghela will also prove handy for the BJP, to offset the losses caused by the Patidars because of his sway with the OBCs, who form a sizeable 35-40 percent of Gujarat's population. Young OBC leader, Gujarat Kshatriya Thakore Sena president Alpesh Thakore has simultaneously emerged as a force to reckon with. Though he is raising issues against the BJP, Thakore, like Vaghela's Jan Vikalp and the NCP, is what comprises the BJP's B-Team and even the C-Team. During the peak of the Patidar agitation, Thakore had repeatedly stated that the OBCs would topple the BJP government if Patidars — who comprise just 12 percent of the population — are given reservations. So, all these factions — Jan Vikalp, NCP, and Gujarat Kshatriya Thakore Sena — put together, the Opposition space is becoming crowded. And we haven't even mentioned the Aam Aadmi Party (AAP), which is trying to begin its own poll preparation in Gujarat following electoral reverses in Goa, Punjab and the Delhi municipal body. The only Opposition party which is on the Congress' side is Janata Dal (United), which has elected a new leader in Chhotubhai Vasava, who has already pledged JD(U) support to Congress. The state has 24 seats from the tribal belt, in which Vasava and JD(U) have considerable clout. The one advantage that the Congress has is the emergence of powerful tribal leader and the lone Janata Dal-United legislator in Gujarat, Chhotubhai Vasava, on the national scenario now and has pledged support to the opposition party. The State has 24 seats in the tribal belt and the Congress can expect to regain lost ground in the region with Vasava's support. 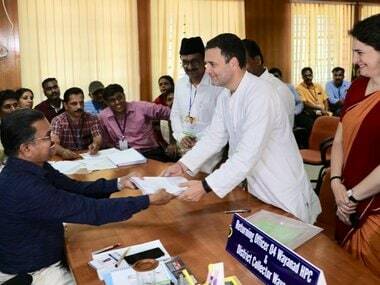 Congress has 14 out of 27 seats reserved for Scheduled Tribes, and Vasava, given his clout among the community, may help the party improve this figure.